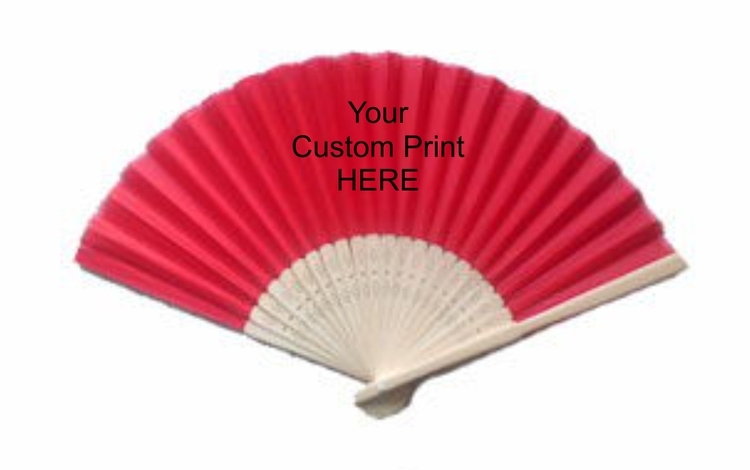 Personalized Folding Silk Fan - accordion style fan personalized with your logo or message for promotions, weddings or special events. For Online Orders: We will review your order and contact you if we have any questions. You will receive a revised invoice via email that will include the cost of shipping, as well as a PDF proof for your review and approval prior to production. IMPORTANT NOTE: We make the best effort to provide clear and color-correct product images on our site that best reflect the true nature of the products. However, web site images are inherently limited in their ability to communicate color, scale and product detail. We want to remind customers to be careful about making assumptions about products from the site image alone. We strongly urge our customers to order actual samples. If you choose not to evaluate a physical sample, we cannot be held responsible for the difference between the image as it appears on your monitor and the final product. Please click HERE to read our Terms and Conditions.